I led a great team at this year’s AWS re:Invent conference in building a workshop for attendees. We took on the daunting task of creating courseware for teams of students to build an end-to-end data warehouse in just two hours. Happily, all teams were successful! So, how did we do it? We used AWS:Marketplace partners to ‘speed up’ our time-to-value. 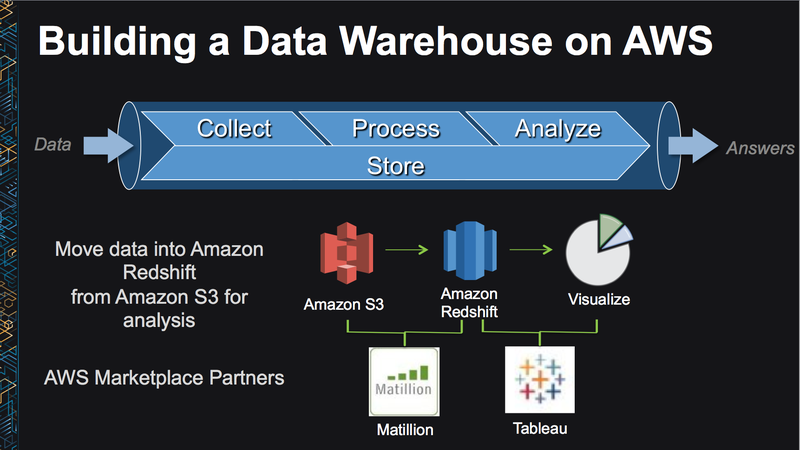 Specifically, we used Matillion ETL for Redshift to load and transform our data. Then we used Tableau to create a dashboard. I’ve posted our session notes / setup on slideshare for you to review. Also, I’ve posted a setup guide on GitHub. This includes AWS cli commands for you to use if you wish to duplicate this exercise yourself. Also, I’m part of a new site that AWS launched to help you to understand exactly what selected AWS:Marketplace Big Data partners have to offers. Here you’ll find interviews with technical leads from these companies, where we discuss what exactly their product is and does, architectural patterns, common use case and also customer success stories. Content is targeted at technical architects. How do you use AWS Redshift? Which AWS:Marketplace Big Data partners have you explored? I’d love to hear from you in the comments section below.